Why not update a classic with a little pumpkin flavor? It is Fall after all, so everything should have a little pumpkin boost! The cooler weather means hot chocolate and it's the perfect thing to jazz up with a little pumpkin flavoring. Pumpkin is, of course, the theme of the moment and it's a nice, subtle addition in this make-at-home version. 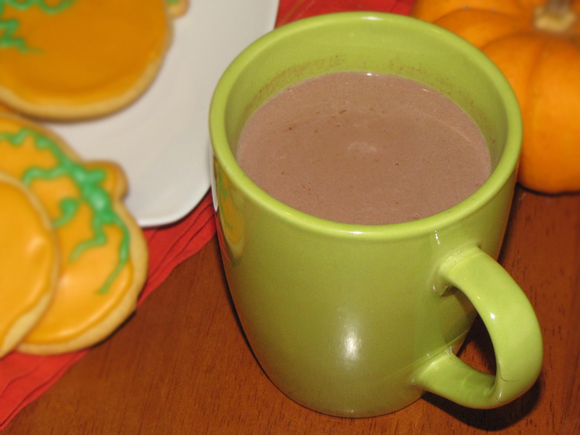 Making your own hot chocolate is really easy, too. It doesn't take much longer than heating up the packet version in the microwave, so be adventurous and go the homemade route whenever you can. I will admit that I was a little intimidated at first, but it's as simple as heating up some cocoa powder, milk and sugar. Yep, that's it! In just a couple minutes, you'll be ready to grab a comfy blanket and cozy up on the couch! 1. Mix cocoa, cornstarch, pumpkin pie spice, and sugar together in small bowl. Heat with milk and pumpkin puree in a saucepan over medium heat. 2. Stir almost continuously until just boiling then turn off heat.